CC-Link IE Field BASIC, part 1 - Allied Automation, Inc. 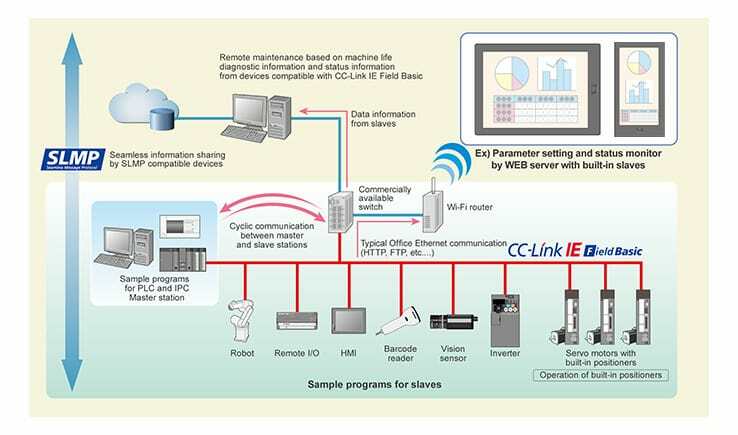 The CC-Link Partner Association has announced the launch of CC-Link IE Field Basic. This is an expansion of the CC-Link IE industrial open networks in the 100Mb/s Ethernet communication which complements the existing Gigabit versions. With recent Industry 4.0 trends, network connection of devices and equipment for small-scale systems are becoming more mainstream and to accomodate this trend, IE Basic was implemented. CC-Link IE Field Basic is simply Mitsubishi Electric’s network for products using the standard built-in 100 Mb/s Ethernet ports. Users of the other CC-Link networks will find the easy intuitive setup very familiar. The cyclic/transient communication design offers high speed data updates and less often non-critical requests. GX-Works2 or GX-Works3 software is used to configure the network and the shared cyclic memory area. Just simply register the .cspp files and the products can be picked from the menu.